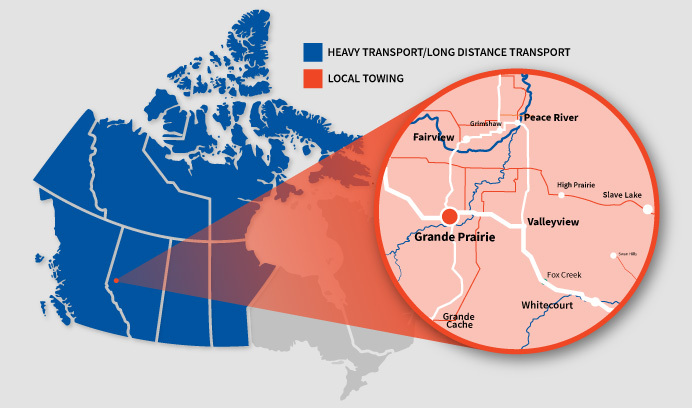 We are located in the northeast side of Grande Prairie in McRae Industrial Park, just south of highway 43. 1. Come to Harold’s Towing & Recovery with valid photo ID. 2. Pay any outstanding bills. 3. Retrieve the stored vehicle. 1. The company must give written authorization for a specific individual (named) to pick up the company vehicle. The letter must be printed on company letterhead. 2. The named employee must come to Harold’s Towing & Recovery with the letter and valid photo ID. 3. Pay any outstanding bills (before the vehicle leaves). 4. Retrieve the stored vehicle. What happens if I need towing after an accident? 1. First, call the RCMP or Police (911) and inform them of your situation. The RCMP will generally contact us on your behalf if towing is needed and will provide us with your contact information as well. You may also call us directly (780-882-2100) for a faster response time. 2. The second call you should make right away (regarding the vehicle) is to your insurance company. We will work directly with your insurance company to determine what to do next. Someone is parked in my parking spot. Can you remove the vehicle? We do not do private towing. We apologize for the inconvenience.